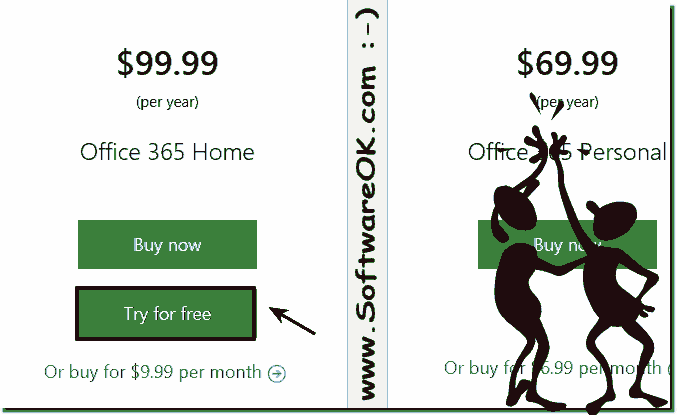 The Microsoft Office from Microsoft completely free, not quite, there is an Office 365.0 from Microsoft, this is 30 days for free testable! Is for several members of a household, and includes office applications for up to 5 users can test it in the home version 30 days long. All Office applications included! Which is very handy before you decide to use the MS-Office in the future for a long time! (Image-1) Microsoft's Microsoft Office test it for free! Ideal for multiple household members, Office applications for up to 5 users, Word, Excel, PowerPoint, OneNote, Outlook, Publisher (PC only), Access (PC only), Included services, OneDrive, Skype. Desktop versions of Office 2016 applications: Word, Excel, PowerPoint, and OneNote Quick info about current versions of Office Installable versions available Quick guide to OS requirements Optimized Office interface on your tablets and smartphones File storage and sharing with 1TB of OneDrive storage per user Always up to date Applications Microsoft support via chat or phone at no additional cost. Per month 60 Skype call minutes per user for calls to landlines and mobile networks Quick info with the requirements and limitations of Skype Advanced Outlook.com security, no ads and 50 GB mailbox Licensed for private use. This-and-That-or-Other - FAQ-2: Microsoft's Microsoft Office should also be available for free, but where?